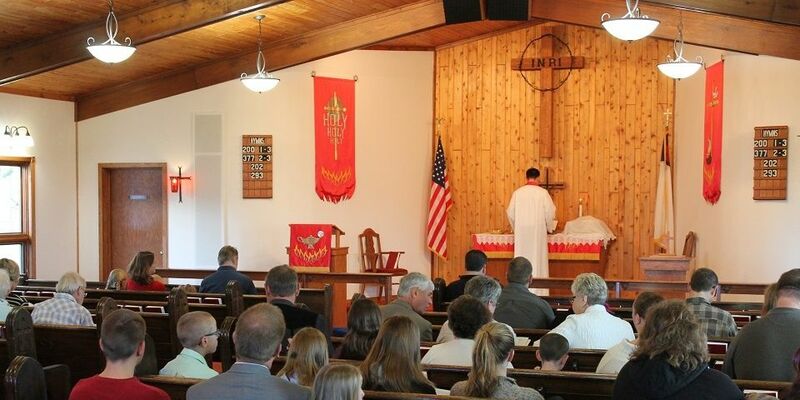 We offer worship services on Sunday mornings. along with a variety of Bible studies and classes. The Invocation – We call on the name of the Savior God as we praise Him. Admitting sins and finding forgiveness – We acknowledge that we have not been or done what God asks. Then we are assured of forgiveness in Jesus. Bible readings – Selections from God’s Old Testament prophets, Jesus’ apostles, and from Jesus Himself in the Gospels. The pastor also gives a brief explanation of each reading. Sermon – Our pastor offers instruction and encouragement in a Bible-based sermon. Expect God’s guidance and grace for dealing with problems as well as the promise of eternal life in heaven through Jesus. Included in your worship folder will be an outline of the sermon. As our guest, you may sit wherever you feel most comfortable. To assist families with young children we have designated the back rows as such so they can easily depart to the Mother’s Room, if necessary, located in the entry area. Sometimes people wonder how they are expected to dress at a church they’ve never visited before. Since the Bible presents no dress code, aside from simple decency and Christian humility, St. Mark’s Lutheran Church doesn’t make any rules either. On any Sunday at our church you may see running shoes and high heels, jeans and suits, or open collars and ties. When a person dresses out of love for God, the choice of dress–casual or more formal–is acceptable to God . . . and us. “When will they take the offering?” “How will it be collected?” “How much am I expected to give?” “Do they want visitors to contribute too?” These are typical worries about church offerings. We pass an offering plate during the service so that our worship may include bringing gifts to God. The members of St. Mark’s have joined together to spread God’s message both in this community and around the world. Visitors should not feel obligated to participate in the offering, and you may wish to learn more about our ministry before bringing your offerings to God through our church. But you are welcome to participate as you heart leads you to give. We assure you, we won’t embarrass you in this or any other way. We want you to feel comfortable and at home with us. Church should be an enjoyable and uplifting experience. St. Mark’s is made up of many families with small children, so small children are certainly welcome! If your child becomes noisy during the service, you can easily remove him/her to our mother’s room located in the entry area. The entry area, mother’s room, and fellowship hall are equipped with speakers so you can still listen to the service. We hope that this information will ease your mind, but if you have a question, please ask someone for help. Don’t hesitate to say, “I am new. What is this about?” Our congregation consists of many new and longtime members who love to help out in any way they can. All of us have felt this way when in a new situation, but we hope you see the people of St. Mark’s to be ordinary people like yourself. We want to accept you as you are and help you become what Christ wants you to be. It is unpleasant to be pressured or to be part of a “membership drive” as though we were heads of cattle, isn’t it? We believe that church membership should be a voluntary thing, and that the most important thing is to trust in the Lord Jesus Christ for forgiveness and salvation. It takes time for this to be cultivated. People need time to evaluate and decide if they wish further involvement. We believe we should respect that need.